It has been said, the greatest teacher is experience, and once again that has been proven to be true. On Friday 08 September 2006, I had a tremendous opportunity to join Kwan Jang Nim Hwang, Arthur Pryor, Sa Bom Nim and William Johns, Sa Bom Nim on a special visit to see Mr. Walter Okarah, one of the Moo Duk Kwan’s most exemplary practitioners, when Kwan Jang Nim flew in to Region 4 and personally presented him with his Sa Dan certification and a new Ko Dan Ja belt. Many members may not know Mr. Okahara as his ability to travel during his Soo Bahk Do career was extremely limited; however, his spirit and energy knew no boundaries. Mr. Okahara was of Japanese descent, born in Hawaii. He served our country proudly as a US Marine, and spent time in Korea during the Korean war. He loved this country and he loved the Moo Duk Kwan. He began his journey to Ko Dan Ja at the age of 53, in 1986. Despite many debilitating health issues, most of which would keep a normal person house-bound, he trained several times a week, beginning his lessons with William Johns, Sa Bom, in Homestead, FL. After hurricane Andrew devastation, he continued training with Chuck Miley, Sa Bom. There were few students and even fewer prospects for new students. 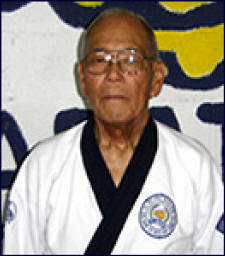 However, as is his character, he remained loyal to Johns, Sa Bom by saying, “I owe it to my Sa Bom Nim to keep the Moo Duk Kwan alive in Homestead.” Even after the Homestead studio closed he continued his training under David Tenedorio, Sa Bom, in Cutler Ridge, FL. He remained active in that dojang until just recently, when it became nearly impossible for him to attend the studio. Kwan Jang Nim observed that the existence of the Federation made it possible for this loyal and dedicated practitioner to continue his Moo Duk Kwan training even as the studios where he trained changed. When serving as Regional Examiner for Region 4, and now as the Chairman of the TAC, I've had the honor of reading many essays written by candidates for Dan Classings and all that I have ever read from the Homestead or Cutler Ridge studios gave significant recognition and credit to Mr. Okahara for his contributions and support of the candidates in preparation for their Shim Sa. The accolades for Walter Okahara just flowed. He was that kind of person… Mu Sang in his presence, Yu Sang in his impact. He touched many lives in Region 4 and not just physically, but spiritually. I recall his E Dan Shim Sa. In spite of crippling arthritis, he insisted on attempting the required twin foot jumping kick for Kyok Pa. Regardless of his physical limitations, he was not going to settle for demonstrating anything less than his best effort. His effort was legendary and he did successfully complete an alternate break. Two years ago, at a Region 4 Shim Sa, many regional seniors gathered in the lobby, discussing the weekend’s events when Mr. Okahara spotted us. Hardly able to walk, he came to us, and ceremoniously and humbly bowed to each of us in rank order. I was embarrassed. It should have been us going to him and initiating the bow, even though he was our Junior in rank. I regret that day more than most in my life. We tried to find a way for Mr. Okahara to attend a portion of the Ko Dan Ja Shim Sa held in Mobile, January, 2006 and on behalf of the Region 4 leadership, I initiated conversations with Kwan Jang Nim about how we might do this. We talked, shared emails, and carried frank conversations to new levels for me. Kwan Jang Nim was rightfully concerned about protecting the integrity of the Ko Dan Ja rank, but not just for those who earned it through the renowned difficulty of the week, but for Mr. Okahara, if he was to become a Ko Dan Ja. Kwan Jang Nim reminded me of the responsibility of making decisions based on the ‘good for the Art; good for the Practitioner’ model. We did not reach a workable solution for the 2006 Ko Dan Ja, but we learned much about the philosophy so important to our Kwan Jang Nim and to the Founder. In July 2006, Mr Okahara’s health turned worse, and once again on behalf of the Regional leadership, I renewed discussions with Kwan Jang Nim regarding a way to for Mr. Okahara to achieve his Sa Dan rank. Again, Kwan Jang Nim gave us the opportunity to grow by exploring how we might initiate such a unique action. He spoke with me, Pryor, Sa Bom, the SAC and the entire TAC to determine the best way to recognize Mr. Okahara’s achievements and contributions. Mr. Okahara modeled our Philosophy of Yong Gi in every action. He was the epitome of Discipline and Respect, showing us how he valued that at the Region 4 Shim Sa two years ago. His Technique was so much more than physical, it was spiritual. He transcended the body, and moved to the mind. His body couldn’t work like the rest of us, but he taught us every day. We finally agreed that his extraordinary lifelong dedication to the education of the membership and his character and determination warranted an immediate personal visit by the Kwan Jang Nim to his hospital room. We met at the hospital that Friday with Tenedorio, Sa Bom and Michael Ramirez, Sa Bom (both peers of Mr. Okahara). We entered his room, dressed in Do Bok. Kwan Jang Nim spoke of the legacy a man leaves behind. Mr. Okahara’s family was there as well, and it was a moment that deserves to be recognized as truly human. 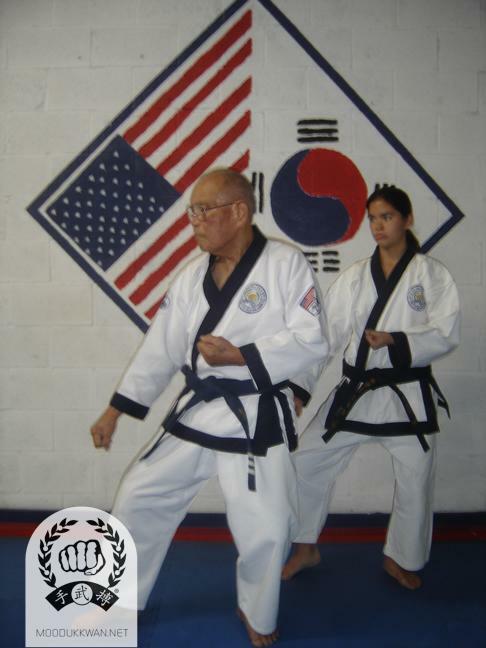 Kwan Jang Nim read Mr. Okahara’s Sa Dan certificate, presented it to him along with a Ko Dan Ja belt and in that moment Walter Okahara became the Moo Duk Kwan’s most honored Sa Dan Master to date. It was our Art’s highest moment of honoring our past and recognizing the contributions of such a dedicated member practitioner. Then William Johns, Sa Bom, Mr. Okahara’s first instructor, wrapped his Ko Dan Ja belt around Master Okahara and asked him to carry it with him to his next home. Some smiled, some cried and all were deeply moved in this moment of our Five Moo Do Values converging in this room. Master Okahara was surrounded by his Kwan Jang Nim, his first instructor, his Seniors in the Region and his peers… this is our art’s History. 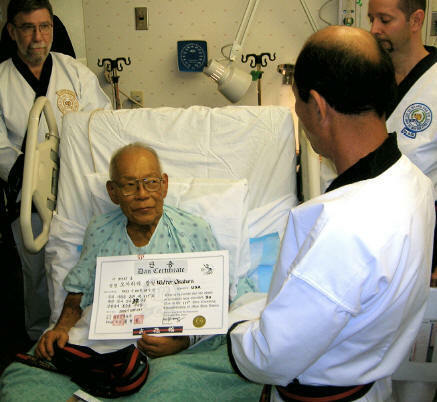 He was so honored that although he had proudly served in the US Marine Corps, he asked to be buried in his Moo Duk Kwan dobok, and requested that Federation members attending his funeral wear their dobok as well. This is how special the Moo Duk Kwan was to him, and how special he was to the Moo Duk Kwan. 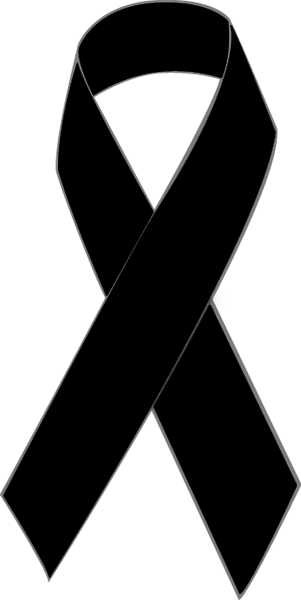 Sadly, he passed away Monday, 11 September, surrounded by his family and close friends and although that was the last time we saw him, Master Walter Okahara lives on in the many hearts he touched and in the Moo Duk Kwan’s unique history as his exemplary energy shaped it.